One of the most destructive spring storms prior to 2010 occurred in 1867 when a spring freshet caused by a combination of heavy rain and melting snow caused the Nemasket River to flood. One of the most dramatic consequences was the washing away of the herring weir at Muttock by the impounded waters of the mill pond above Nemasket Street. A severe storm of rain and wind prevailed here, on Saturday night last [February 9, 1867]. This, at once thawed and set in motion the previous heavy fall of snow, so that our streams experienced the effects of the combination of two heavy storms.... At the Muttock works, the herring weir dam was swept away." 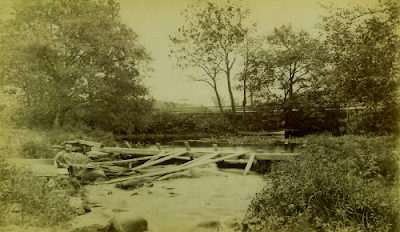 Nemasket River at Muttock, photograph, 1880s. This photographic view depicts the Nemasket River some twenty years after the disastrous 1867 storm which washed away the herring weir dam. The dam was not rebuilt and the site was left to nature which has begun to encroach upon the river in this view. Note the young boy fishing on the left bank.